Are you a current-season sewer? Or like me, do you also like to create some garments for the upcoming season? I like to do both! 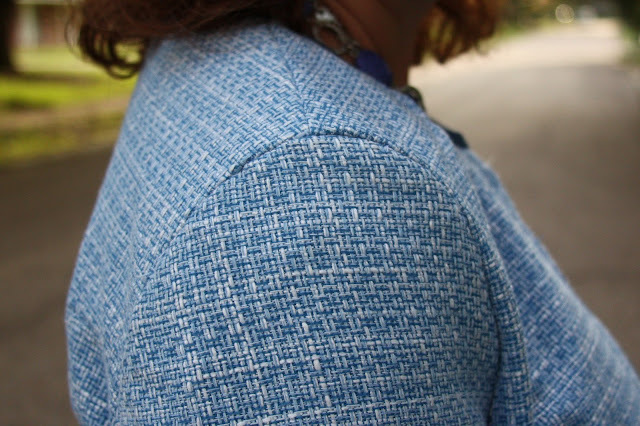 For this month, I wanted to make a few transitional garments and when I found this gorgeous boucle, I knew exactly what I wanted to make! Both called for the use of Boucle so it was a win-win! For the jacket, I interlined the entire body of the garment using fusible mediumweight Pellon interfacing. I chose against interlining the sleeves and am happy with that decision. 1. Used multiple layers of woven interfacing cut on the bias in the sleeve cap area to keep it from collapsing. In addition to the 2 layers of interfacing, I also cut one layer of hair canvas. This also supported the sleeve head and gave it what it needed so the sleeve didn't collapse. 2. Cut the self-bias tape 1/4" wider to give a bit more turn-under room. 1. I've made this jacket before and even though I love it, I don't think I need two jackets with self fringe on them. I eliminated the fringe, but added a bias-cut center front section. 2. 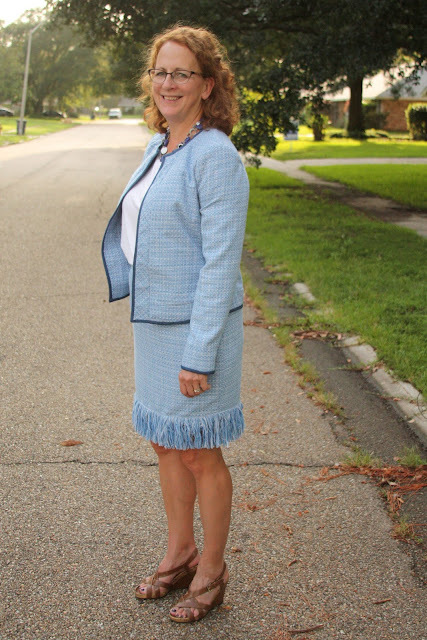 Since the skirt has self-fringe, I decided not to over do the fringe on the jacket. Too much is simply too much! 3. 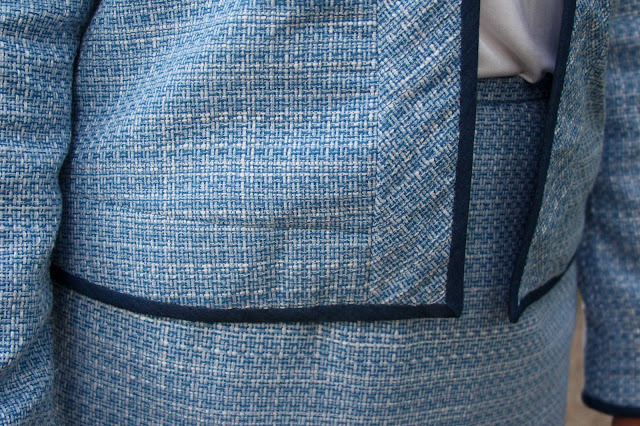 I used complimentary denim fabric for the trim on the jacket. Did you see my lining? It is by Maggy London, also purchased from FM. I truly wish I'd purchased about 10 yards of this! I love the colors and cute linings make me happy! I can't tell you how pleased with how well this turned out! I feel like it is a modern 'suit' that will be perfect worn together or as separates. I love the lining. The color blue looks great on you. Good job! Love it! Also the color is so pretty. You are so smart to creat a suit that looks like it will work just as well as separates. Well done! Beautiful outfit & classy, love the use of the Boucle. 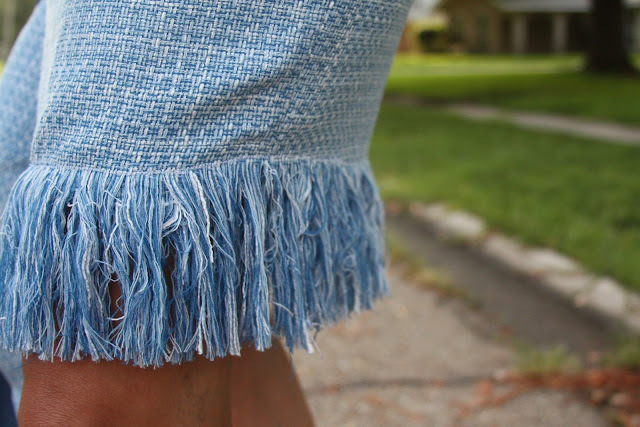 The fringe on the skirt is an A+! Great job & You look lovely! This is really gorgeous, Sue! Your work on the sleeve cap really paid off- it looks perfect. 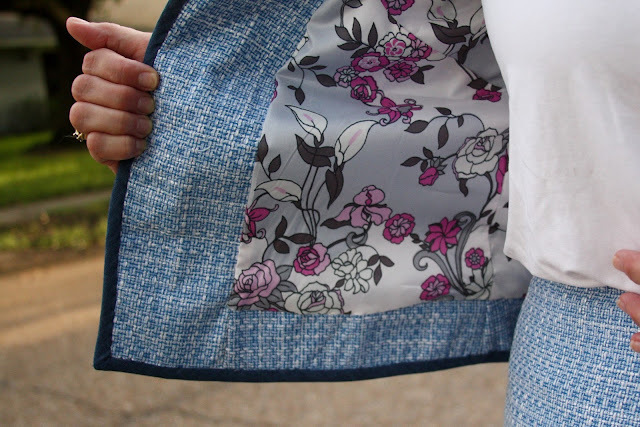 I love the use of denim for the trim and the floral lining. 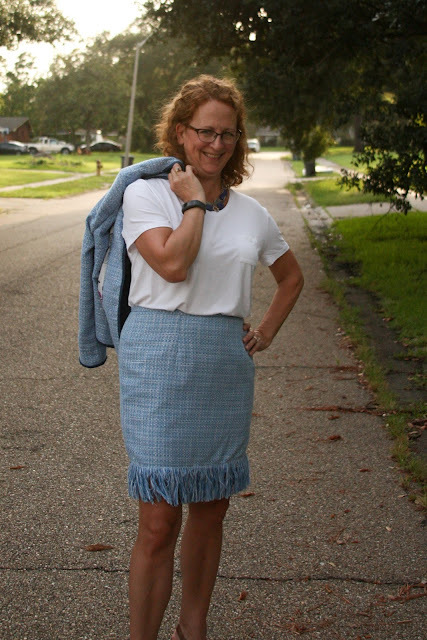 It all goes together really well, and the fringe on the skirt is just the icing on the cake! This is a great addition to your wardrobe. Love all the things you did to the jacket. The sleeves are perfect. Really like the fringe on the skirt too. Wonderful job! Beautiful 👗 love the colors and fabric choices!!! And a double thanks for sewing my fringe skirt pattern 🤗 great fit all the away around! You did a great job. I especially love reading about how you handled the sleeve cap/shoulder. The suit looks fabulous on you. Thanks for sharing. 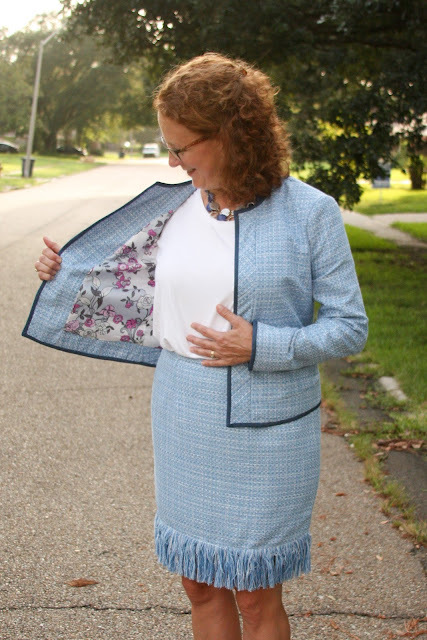 Oh my goodness... you should be pleased with the way your beautiful Couture Suit turned out because... You really did an amazing job with your choices of fabrics, linings, interfacings and then every single sewing detail.